DHEA 100 mg was recommended to my husband by his doctor. DHEA could be used to treat adrenal insufficiency and alleviate symptons of mild depression. 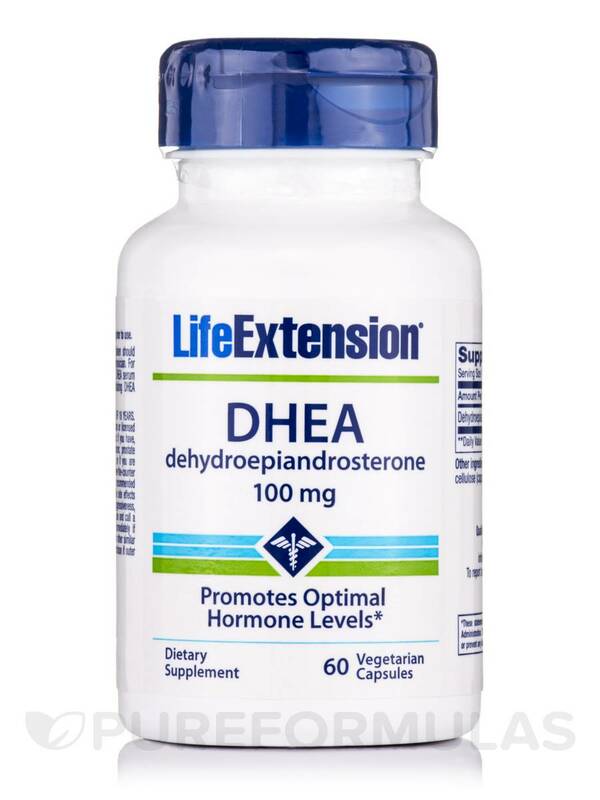 DHEA 100 mg – 60 – Vegetarian Capsules from Life Extension® is a supplement that enhances your intake of the steroid hormone Dehydroepiandrosterone (DHEA). This formula helps in the production of androgen and estrogen steroids and may aid in supporting healthy aging. DHEA present in this vegetarian supplement from Life Extension® appears to support healthy aging. Studies suggest that DHEA levels decrease with age. The adrenal glands and liver produce DHEA that appears to support memory‚ a healthy mood and cognitive function. Some people feel that it could promote the health of bones and support the heart and circulatory system. DHEA might be beneficial in individuals to improve their sexual function and help enhance muscle mass. It could slow the process of aging‚ support healthy lungs and skin and may provide relief from fatigue. In addition‚ it could optimize the immune system. Get DHEA 100 mg – 60 – Vegetarian Capsules from Life Extension® to slowdown your aging process. For optimal results‚ take one capsule in the morning. Not for use by individuals under the age of 18 years. Do not use if pregnant or nursing. Consult a physician or licensed qualified health care professional before using this product if you have‚ or have a family history of breast cancer‚ prostate cancer‚ prostate enlargement‚ heart disease‚ low "good" cholesterol (HDL)‚ or if you are using any other dietary supplement‚ prescription drug‚ or over the counter drug. Do not exceed recommended serving. Exceeding recommended serving may cause serious adverse health effects. Possible side effects include acne‚ hair loss‚ hair growth on the face (in women)‚ aggressiveness‚ irritability‚ and increased levels of estrogen. Discontinue use and call a physician or licensed qualified health care professional immediately if you experience rapid heartbeat‚ dizziness‚ blurred vision‚ or the similar symptoms. Keep out of reach of children. Do not purchase if outer seal is broken or damaged.